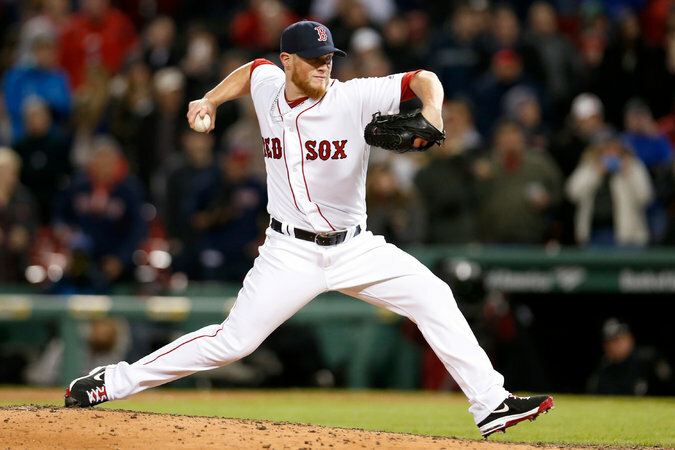 Boston closer Craig Kimbrel struck out all three Orioles he faced, for his second save. Baltimore had won seven straight. The Baltimore Orioles finally lost after opening the season with seven straight wins, beaten by the bats of Xander Bogaerts, Jackie Bradley Jr. and the Red Sox, 4-2, on Wednesday night in Boston. The Orioles were the last undefeated team in the majors, and the loss ended a winning streak that was the franchise’s longest to start a season since it moved to Baltimore in 1954. The team opened 9-0 in 1944 as the St. Louis Browns. The Red Sox ended a three-game losing streak. Bogaerts hit a two-run double, and Bradley had a tiebreaking triple. Chris Davis hit a two-run homer for the Orioles. MARINERS 4, RANGERS 2 Dae-Ho Lee hit a two-run, pinch-hit homer with two outs in the 10th inning, lifting Seattle over Texas for its first win of the season at Safeco Field. After starting 0-5 at home, the Mariners won on Lee’s second home run of the season. Robinson Cano hit his fifth homer for Seattle. Sports of The Times: A Second Chance for I.A.A.F.’s Sebastian Coe. How Can That Be?